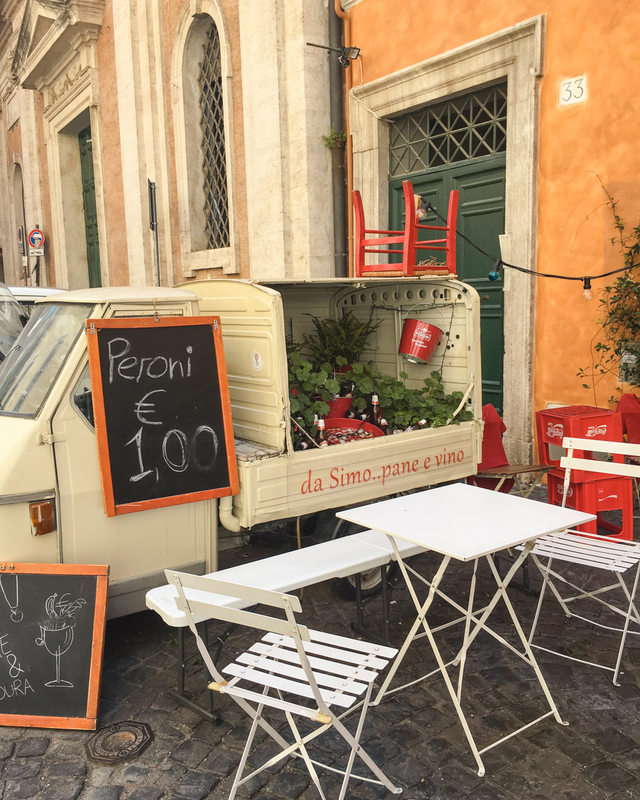 One of the best ways to experience Rome is to sit at a table outside, along a cobblestoned street, eat pasta and drink it all down with a glass (or two) of red wine. 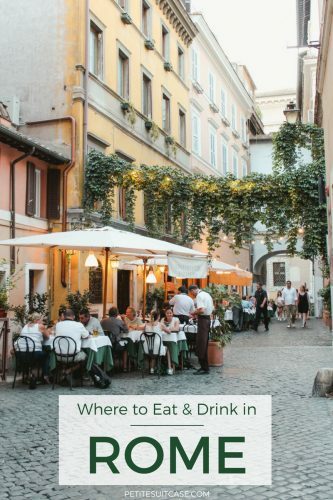 There are so many restaurants and figuring out where to eat and drink in Rome can be overwhelming. After living in Rome and many trips back since, there’s a few spots I’m always returning to. 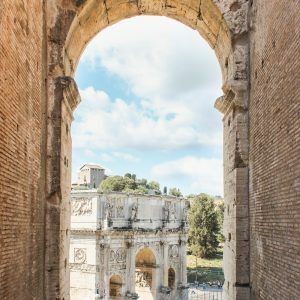 In this post, I’ll share my old favorites and places I still want to discover plus a few insider tips to keep in mind during your trip to Rome. 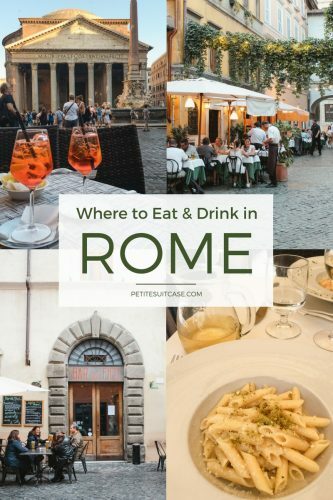 When it comes to finding a great restaurant in Rome, try to steer clear of the main tourist attractions or places with massive photos plastered on a billboard outside. Also, I never go to a restaurant where someone is outside hassling the people walking by. Good food speaks for itself. The places with the best food won’t have someone trying to get you to go in their restaurant because they’re already booked with reservations. Try to make a reservation if you can. Even if it’s just a few hours ahead, they’ll really appreciate it and you won’t have to worry about anxiously darting from place to place trying to find dinner. Just because a restaurant has a coperto (cover charge), doesn’t mean it’s a tourist scam. I’ve dined at many restaurants in Italy and even the local spots in my neighborhood near Naples will have a coperto. It’s completely normal. So don’t feel scammed if there’s a few extra euro on your bill. 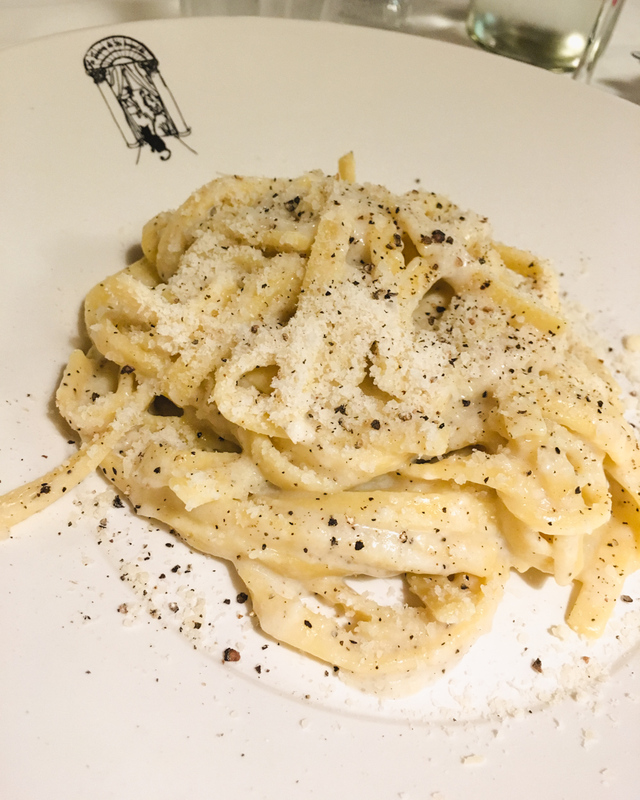 La Taverna dei Fori Imperiali has some of the best cacio e pepe I’ve had in Rome… and I eat gluten free! The pasta is homemade and the service is friendly. Via della Madonna dei Monti, 9. 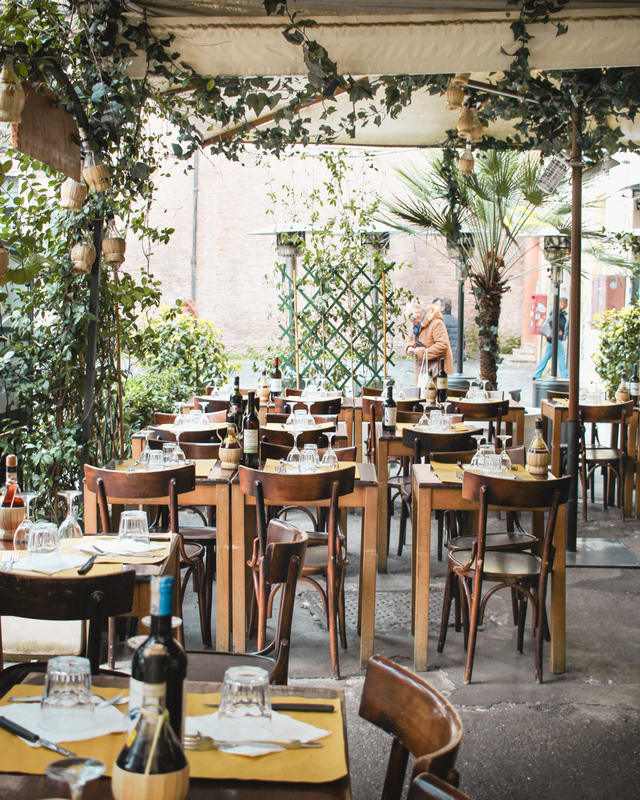 Pianostrada has an inviting atmosphere with a charming outdoor courtyard in the back. Their food is always fresh, service friendly. I love also how they have their wine menu on paint swatches. Via delle Zoccolette, 22. 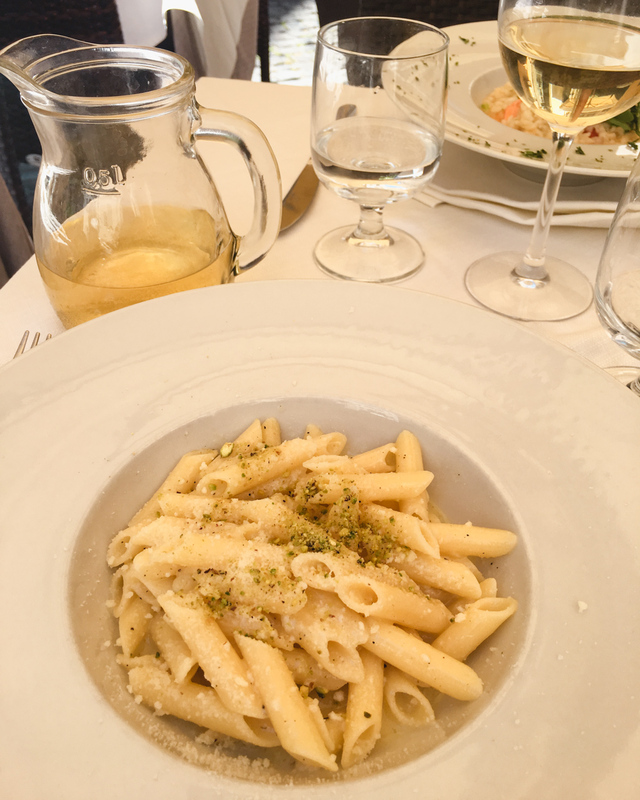 Bar la Licata is a casual, quick stop that has everything…. good for coffee, a drink or lunch. 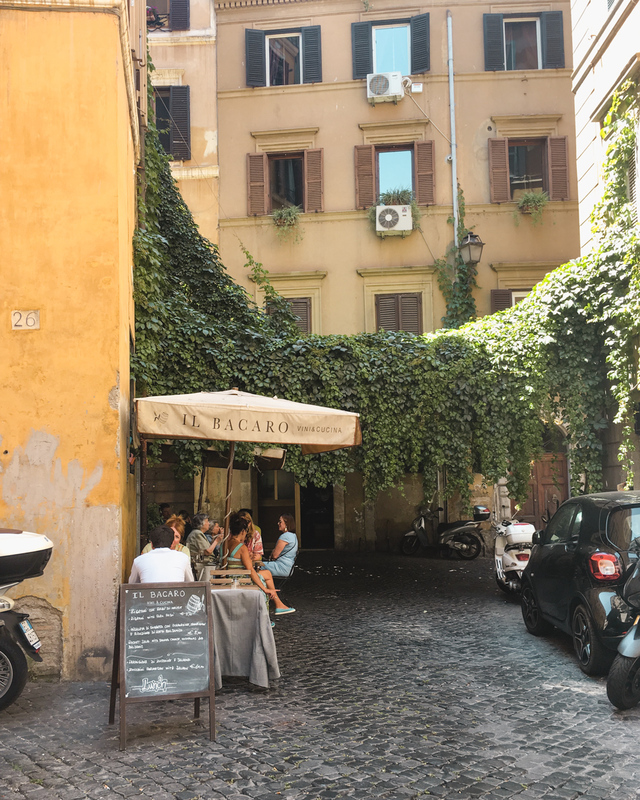 It’s near the Colosseum, so it’s the perfect haven to go and relax after a morning of exploring the Roman Forum. Via dei Serpenti, 165. Felice A Testaccio might be a bit of a trek from the center and most attractions, but that’s part of what makes it so good. 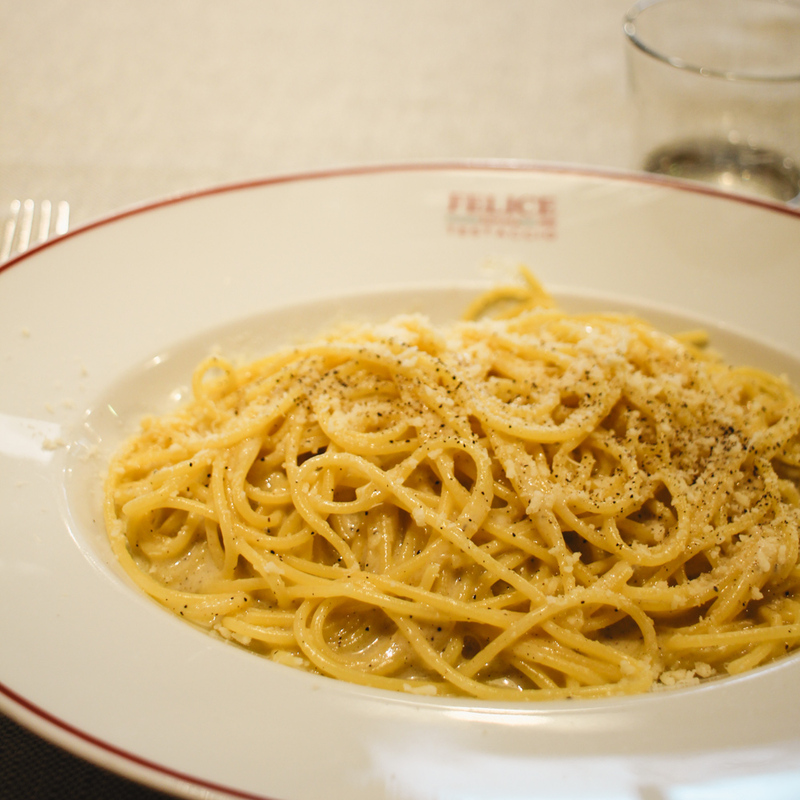 This place was filled with locals and everyone was ordering the Roman speciality, cacio e pepe. Via Mastro Giorgio, 29. Roscioli and Da Enzo are also known for amazing pasta and cacio e pepe in particular. From the historic cafés and quite spots down back streets, you’ll be spoiled for choice when it comes to espresso. A caffé (a shot of espresso) will usually cost about 1 euro at the counter, depending on the place. Sitting at a table will cost a little more, but sometimes it’s worth it to rest your feet and enjoy the atmosphere. 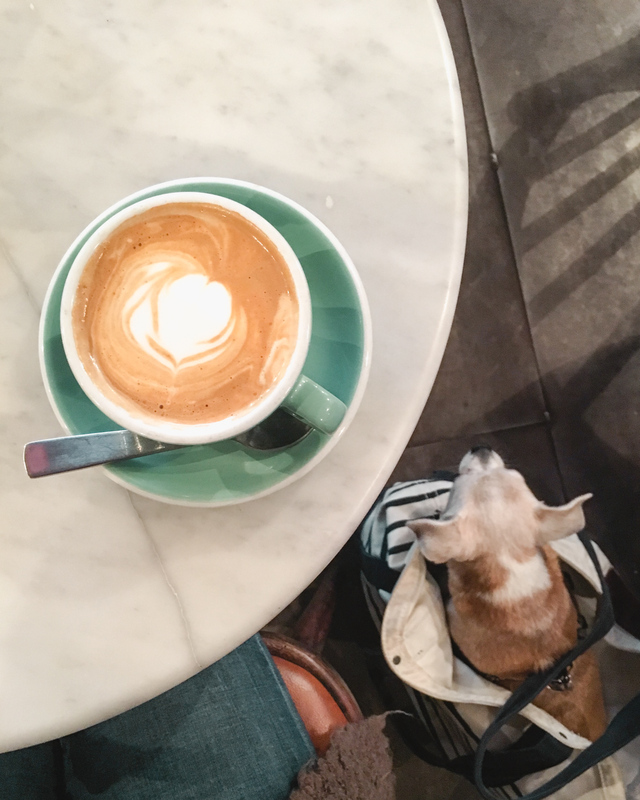 Cafe Barnum – I love the vibe and the decor of this little eclectic cafe. It’s also the rare place in Rome you’ll see people working on their laptops. I’ve never had more than coffee here, but the menu changes frequently on the chalkboard with daily specials. Via del Pellegrino, 87. Sant’Eustachio Il Caffè – It doesn’t look like much from the outside, but their espresso is some of the best in Rome. Piazza di San Eustachio, 82. 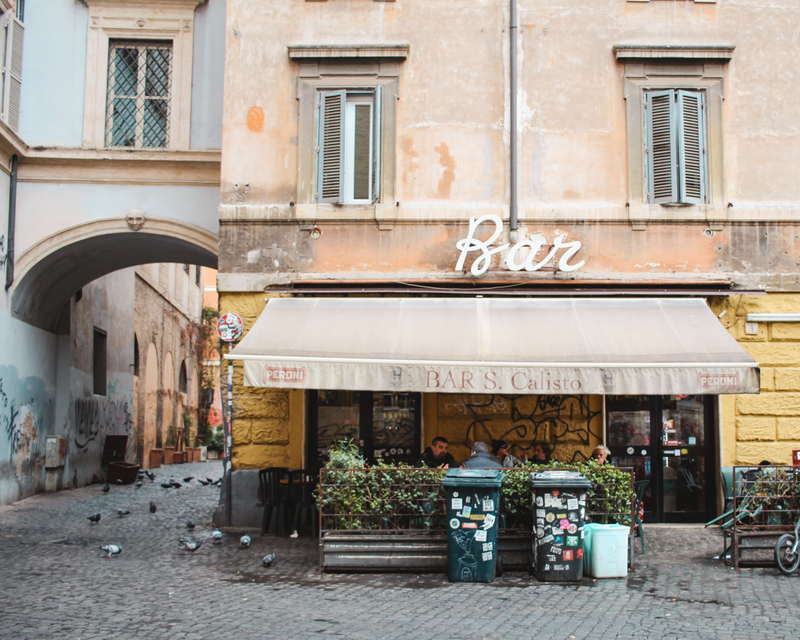 Antico Cafe Greco – The oldest coffee shop in Rome. Think red velvet chairs, marble table tops and ornate art on the walls. Stand at the bar instead of sitting at a table to save a few euro. However, this institution might be sadly forced to close its doors soon. Via dei Condotti, 86. Definitely partake in an aperitivo, a drink usually served with a light snack before dinner. I’ve even been to places that will include so many free snacks you won’t be hungry for dinner! At a minimum though, you should get peanuts or potato chips. Be sure to order an Aperol Spritz. 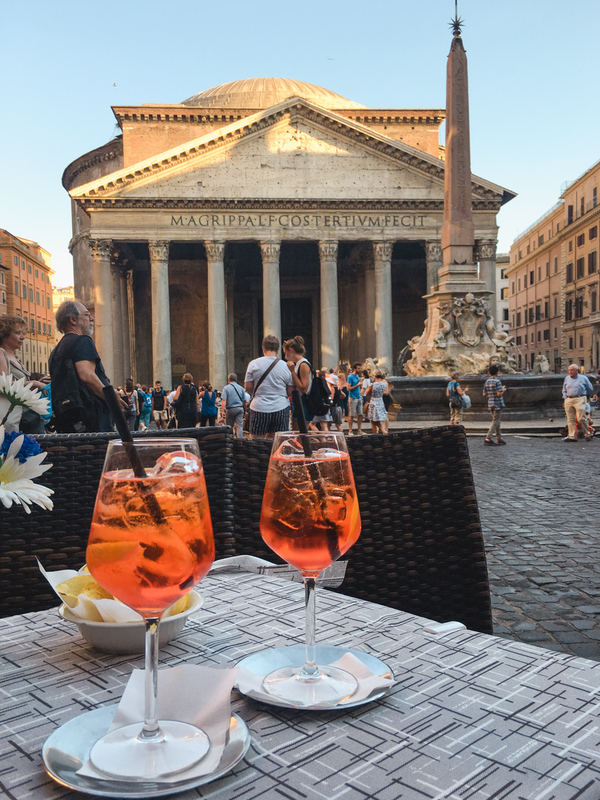 I’ll never have a meal next to a tourist attraction, but I can’t deny a glass of wine or a cocktail in front of the Pantheon. Top notch people watching too. 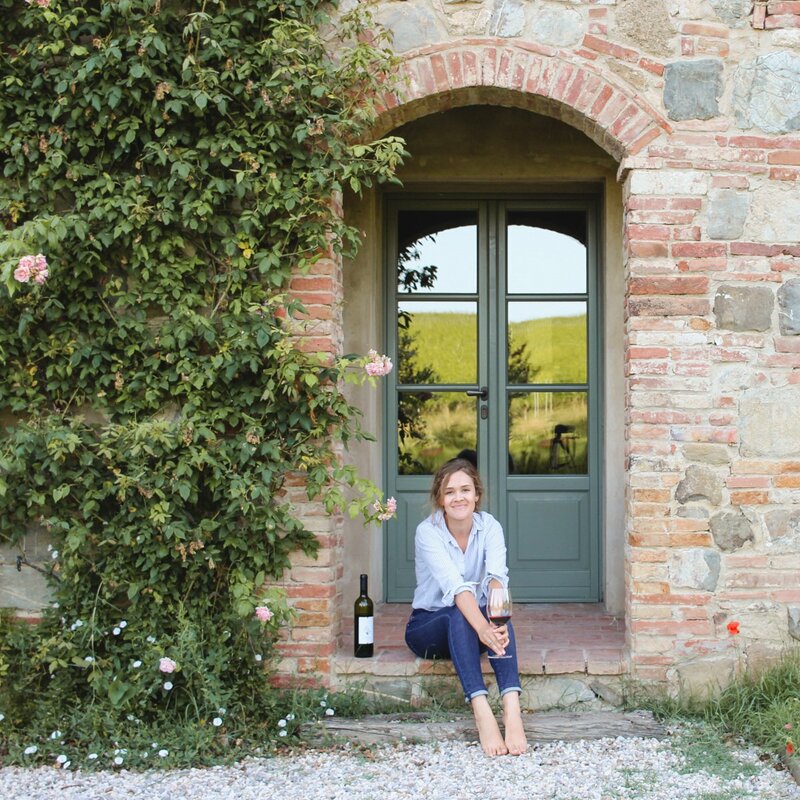 My friend and Roman resident, Livia Hengel, recently introduced me to Enoteca il Goccetto. If finding a cozy wine bar and drinking local specialties is on your itinerary (as it should be! 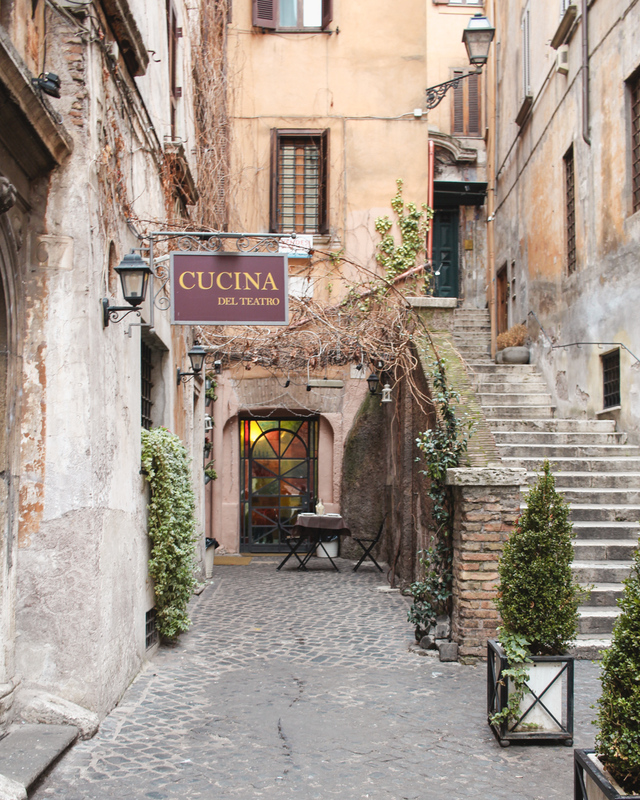 ), read Livia’s suggestions on the best spots in Rome here. Enoteca il Goccetto – This is the perfect spot to enjoy local wines in cozy atmosphere. Via dei Banchi Vecchi, 14. Pimm’s Good not only has one of the best leafy facades in Trastevere, they also make pretty decent cocktails. Via di Santa Dorotea, 8. 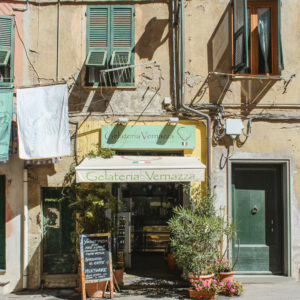 La Bottega del Caffè – I love having a drink on the outdoor patio that faces a near by piazza. Piazza della Madonna dei Monti, 5. 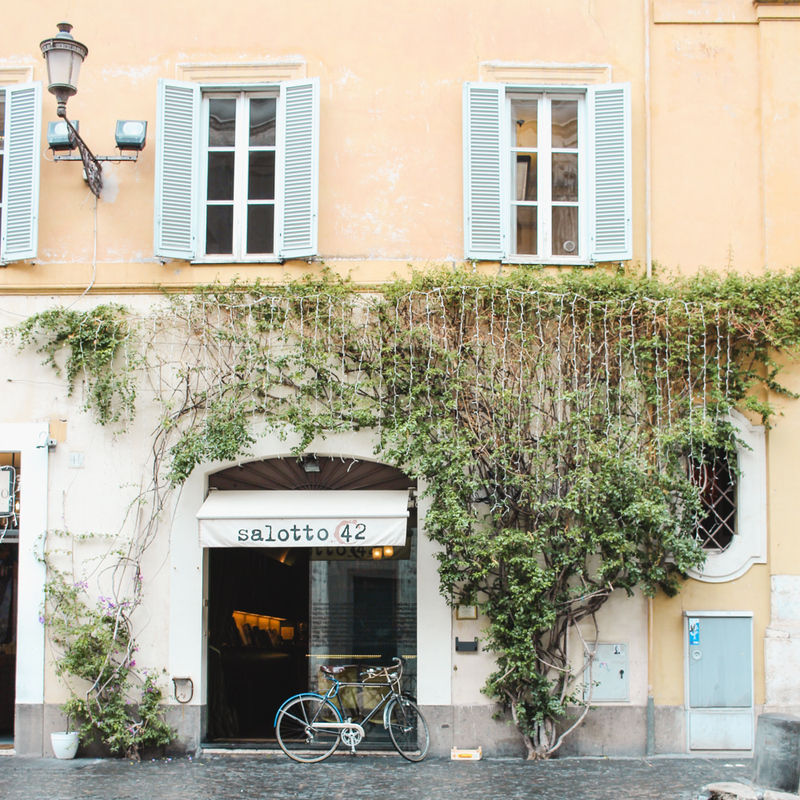 Salotto42 – A trendy spot for a cocktail right in the middle of Piazza dei Pietra in front of the Temple of Hadrian. Piazza di Pietra, 42. 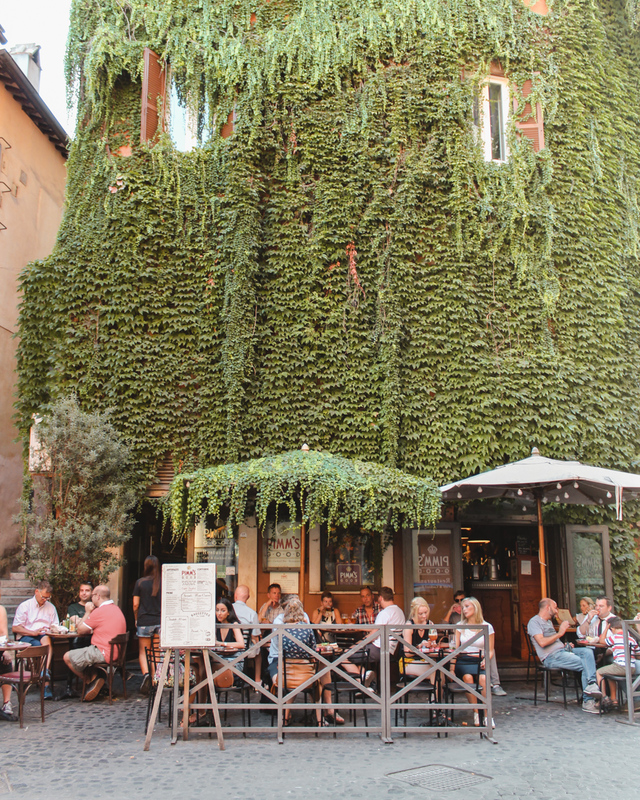 Bar San Calisto – I first went to this little gem in Trastevere over 10 years ago when I lived in Rome. Luckily, some things never change. 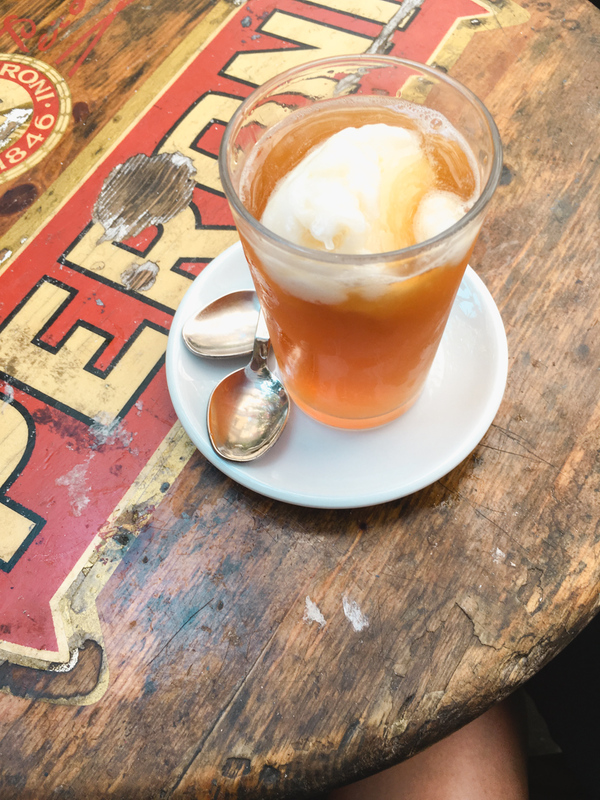 On a warm day, sit on the patio with a glass of wine (a large pour is just 2 euros) or their version of an Arnold Palmer (iced tea with lemon gelato). Piazza di S. Calisto, 3. 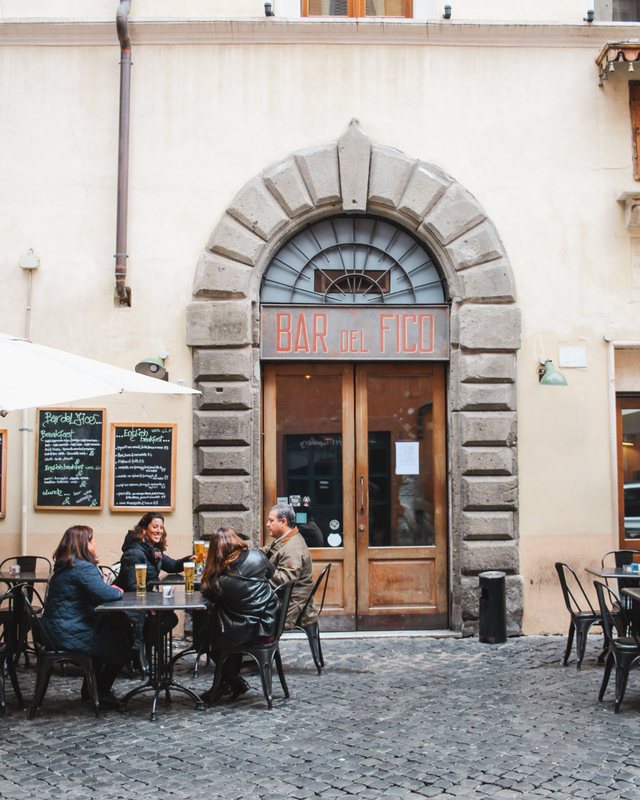 Bar del Fico – I always come here for a spritz and the lively atmosphere. The tables outside are usually full and there’s always older men placing chess in the shade. Da Simo Pane e Vino – I first stopped here because of the “Spritz: 3 Euro” chalkboard sign, but I keep coming back each time I visit because it’s so inviting and the staff are friendly. If you’re like me, you can easily handle two gelatos a day. Luckily, there’s no shortage of gelato in Rome. Try to avoid the places that have a hundred flavors with a display case that looks like a toddler went wild in the toppings section of a self-serve frozen yogurt shop. 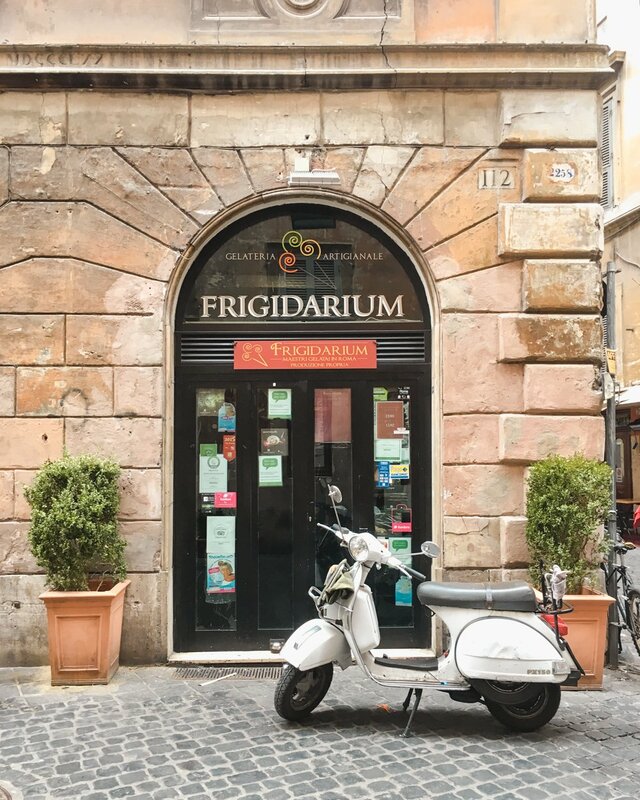 Frigidarium – This is the spot for all the rich, chocolatey flavors. The chocolate dipped cone can be a mess, but you should go for it. Via del Governo Vecchio, 112. Gelateria del Teatro – Fresh ingredients and artisanal flavors. It’s also next to the cutest courtyard. Via dei Coronari, 65-66. Want to do it all? 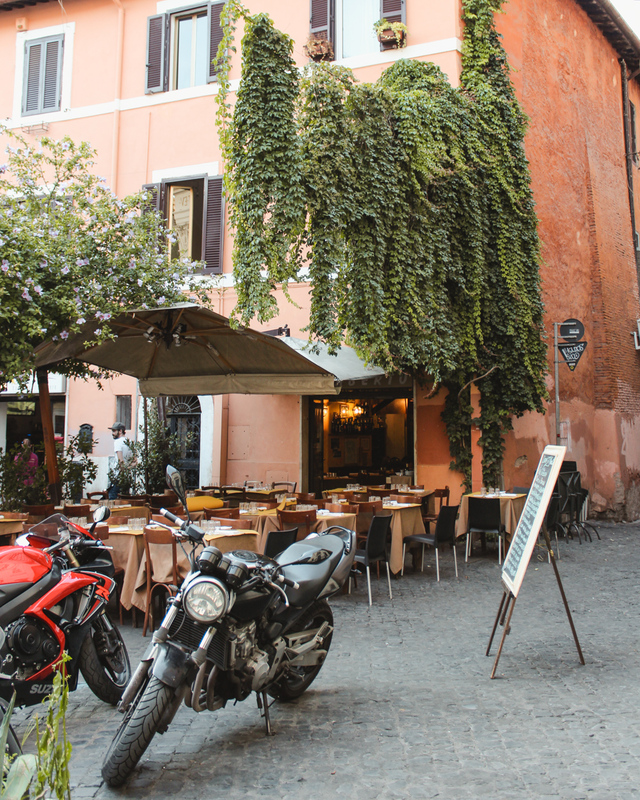 Consider taking a food tour in Trastevere with the Roman Guy. Explore four different stops and have dinner with a local guide. 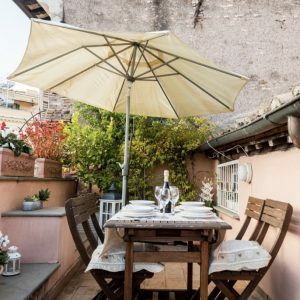 Includes pizza, a full course Roman meal, wine and gelato… what more could you want? Enter code PETITESUITCASE to get 5% off tours with The Roman Guy. Want this guide to go? 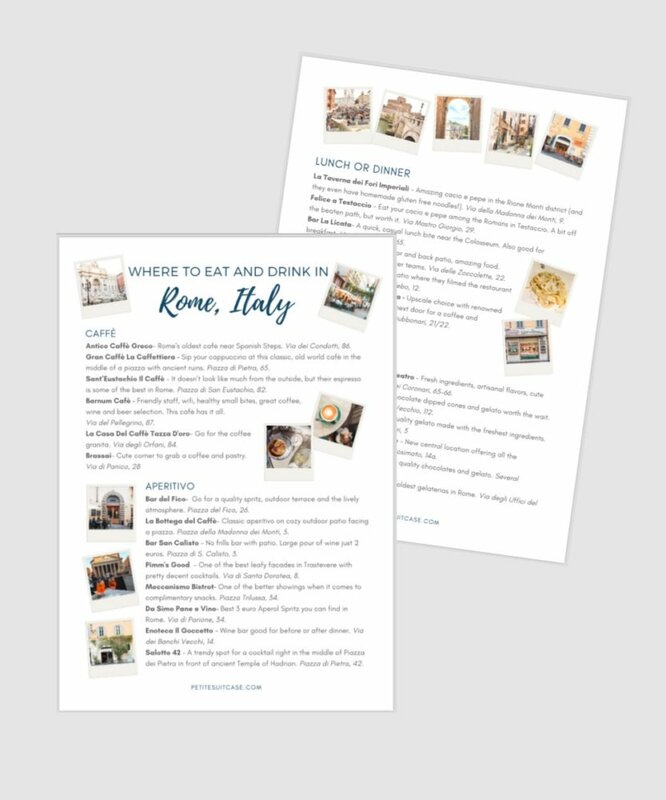 Subscribe to the newsletter and receive a FREE printable cheat sheet with the best places to eat and drink in Rome. This is an amazing post! 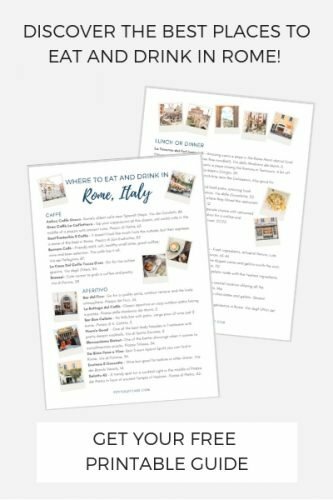 I am so excited to go to Rome next month and I literally bookmarked every single recommendations! Looking forward for some drinks in Trastevere! Thank you!! There are so many wonderful places in Rome. Enjoy! Thank you for all of the recommendations, your pictures are all so beautiful. 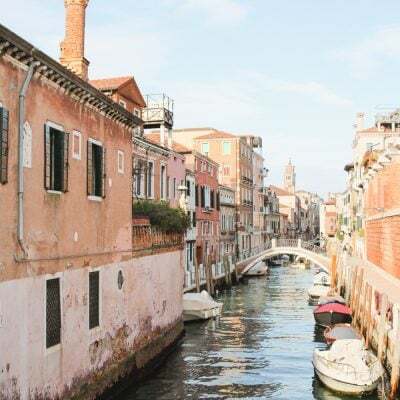 I have come across your blog today for the first time and have read almost every Italy post!!! It is such a beautiful country. Thank you so much! I believe the place is called Tempio Bar. See it here on Google Maps.